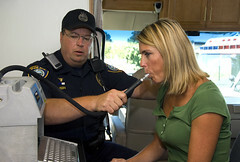 Breathalyzer Tests: Are They Really Accurate? Driving under the influence (DUI) has become an epidemic in America. In fact, some statistics show that around one-third of all fatal auto collisions involve alcohol. Police tout breathalyzers as an effective means of combating drunk driving and the courts often go even further by having ignition interlock units, which amounts to portable breathalyzers installed on the cars of those convicted of DUI. These may both seem like great devices, but in actuality, they may not always be as accurate as we’d like to think. Most people believe that if they fail a breathalyzer, they’re basically automatically convicted. What they don’t realize is that courts have recognized a .01 percent margin of error in even the best working breathalyzers, and they’ve concluded that this is acceptable. This obviously means anyone that blows a .08 percent blood alcohol content (BAC) could actually be between .07 and .09. This, however, isn’t where the inaccuracies end. There are several things that can cause a breathalyzer to say a person is intoxicated when they may not even be close to the legal limit. People with diabetes, for instance, may fail breathalyzers since the device sometimes detects acetone, a chemical that a diabetic person has too much of in their body, as alcohol. Whether you listen to a Los Angeles or a New Jersey DWI lawyer, you will hear that breathalyzers that have not been properly calibrated can actually give completely inaccurate results without detecting any chemicals at all. The simple fact is this: breathalyzers are fallible. When a person is convicted of DUI, they will sometimes be required to put an ignition interlock device in their vehicle. The individual will basically have to pass a breathalyzer test with this device before their car starts. In addition, they are subject to random retests while driving. This seems like a great way to stop drunk driving and prevent any witty tricks an intoxicated driver may use to try to beat the system. Sadly, ignition interlock devices can be as unreliable as breathalyzers. Eating spicy foods can actually cause these devices to give an incorrect reading at times. A person who has recently used mouthwash will likely fail their test as well. After a certain number of failed tests, a person’s car will not start, and if they happen to be driving when a failed test occurs, most devices will cause the car horn to blow until the vehicle is turned off. These failed readings are reported to the courts. An inaccurate reading from either a breathalyzer or ignition interlock device can be detrimental. When a breathalyzer is incorrect, it can cause an innocent person to be found guilty of a drunk driving offense that they did not commit. Sadly, this will often lead to a suspended license, heavy fines, possible jail time and employment difficulties in the future. It’s even likely that their auto insurance rates will go through the roof. Failed ignition interlock device tests can be just as bad. If these devices show a failed test when an individual isn’t intoxicated, that innocent person may have their probation revoked and possibly be put into jail. In some instances, failing a rolling test can even land a person an additional DUI charge. The worst part about this is that, in most areas, a second DUI charge holds far more severe consequences than a first. There’s no doubt that breathalyzers and ignition interlock devices can save lives, but it must be recognized that they are fallible, man-made machines. These types of devices already have a specified margin of error, and unfortunately, this is when they’re in absolute perfect working order. The truth is that anyone who fails a breathalyzer and is arrested or who is facing repercussions for failed ignition interlock tests would do well to seek out professional legal help. Being an advocate of driving alert and sober enables Nadine Swayne to present this information. The New Jersey DWI lawyer group at Levow & Associates has over 15 years of aggressively representing their clients facing DWI charges. Their attorneys are trained in field testing by the National Highway Traffic Safety Administration and are the only firm in New Jersey that has access to both breath testing machines in order to help with their clients cases.